Hertfordshire based JK Engineering (JKE), one of the UK’s fastest growing high precision machining companies, is the latest firm to invest in a MecWash parts washing system to help automate its production process. Established in 2001, JK Engineering’s founding aim was to ‘provide a guaranteed rapid turnaround service for the F1 and medical component industries’ where short lead times and ‘right first time’ capability were critical to the company’s growth. It has since expanded its operation and now produces a significant number of parts destined for the aerospace market. 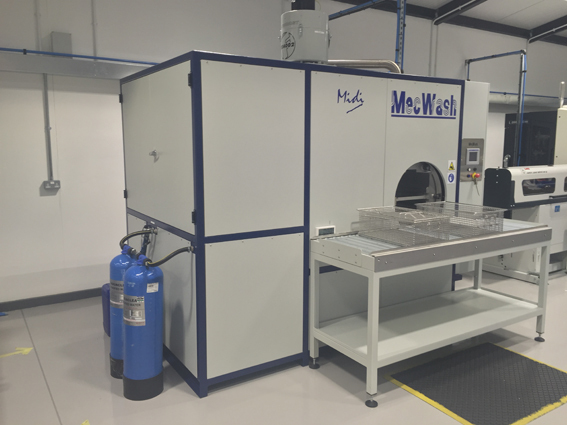 MecWash Managing Director, John Pattison, comments, “The Midi is very popular with customers producing complex and intricate machined or pressed parts for sectors including aerospace that require very high standards of cleanliness, surface finish and dryness. JKE’s Commercial Manager, Max Swinbourne, elaborates, “The MecWash system perfectly represented our company ethos. We really love the fact that it is essentially automated. We looked into different systems where the labour demands were quite extensive, and we saw little value-adding in having an employee dedicated to parts washing. The system gives us a very, very low running cost when you factor in the labour cost. JKE spent a great deal of time with the engineers at MecWash to develop a system that can cope with typical parts found in the aerospace and medical industries, and the demands that those type of parts have. “The engineering department at MecWash was very sympathetic to our needs and alongside us, quickly turned our requests into reality. It was a real pleasure working with them! They truly are experts in their field and we were taken back by their speed in customising our system”, says Max. JK Engineering’s founder and current MD, John Kenny, had a clear vision for how the factory should both look and operate from the outset of the business, as Max explains, “JKE is very young when compared to our contemporaries and we operate from a very modern factory with an enviable amount of high tech equipment. This is very apparent when you walk around JKE – the factory is spotless and a number of robots are used to automate the production process as much as is feasibly possible. Every machine is loading, running, and unloading jobs with minimal people present.